The Carter Center observed elections in Guatemala in 2003 and has assisted the nation in stopping the suffering caused by river blindness. A small Carter Center delegation observed Guatemala's 2003 electoral process, campaign finance issues, and concerns about voters' access to the polls, access to the media and public resources for all political parties, and significant pre-electoral intimidation and violence. Center observers also examined the broader human rights environment, such as the lack of accountability for past and present abuses, persistent attacks against human rights defenders, and systemic discrimination against the indigenous population. A small Carter Center delegation observed Guatemala's 2003 electoral process, focusing on human rights and campaign finance issues relevant to the presidential, legislative, and mayoral elections. The Center's election project sought to heighten domestic and international attention to a broad range of issues, including concerns about voters' access to the polls, access to the media and public resources for all political parties, and significant pre-electoral intimidation and violence. The November 2003 elections demonstrated an urgent need for full protection of all human rights; economic justice for rural and indigenous people; legislative action, including campaign finance reform; and comprehensive civic education programs. The Center noted significant problems with inadequate preparation among some election officials, disenfranchisement of many voters because of problems with voters' lists, limited investigation and prosecution of election-related crime by authorities, and widespread incidents of vote buying and intimidation. The voting process in the Dec. 28, 2003, runoff presidential election was more efficient and without violent incidents, though voter turnout was much lower than during the November balloting. The Center encouraged a strong role for independent civil society organizations in monitoring the performance of all state institutions. Such civic participation would build upon the unprecedented and constructive role of civil society observers during the 2003 electoral process and help deepen Guatemala's democracy. Carter Center staff participated in the Organization of American States' observation missions to both rounds of the 1999 presidential elections. The first elections since the signing of the Peace Accords, the elections were generally free, fair, and orderly, with a larger turnout of eligible voters than in recent past elections. The Carter-Menil Human Rights Prize was awarded in 1986 to Grupo de Apoyo Mutuo, a Guatemala human rights group founded by relatives of the disappeared. In 1990, the prize was awarded to The Consejo de Comunidades Etnicas Runujel Junam, a group formed in 1988 by a Mayan community to monitor and defend human rights and fundamental freedoms. President Carter and Dominique de Menil established the $100,000 prize to enable human rights activists to continue their work and focus global attention on their struggles for justice. The prize was awarded annually until 1994 to individuals or organizations for their outstanding efforts on behalf of human rights. The Global Access to Information program conducted a study in 2014 that found that women in Guatemala have a more difficult time than men accessing information to which they are entitled. There are many reasons for this — among them, poverty, illiteracy, machismo culture, a lack of knowledge of laws and rights, fear of asking or of retribution, and the time constraints associated with running a household and caring for children. The Carter Center is now working in Guatemala to find ways to improve women’s access to information, because with real access to meaningful information, women can make more effective decisions and harness the opportunities available for education, land, agricultural production, or starting a business. Although Latin America spends relatively less on defense than most other regions, expenditures on expensive weapons systems divert scarce foreign exchange from more effective investments and compel neighbors to spend more on defense and, by doing so, generate international tensions. Concerned about an arms race in Latin America, the Carter Center's Council of Presidents and Prime Ministers of the Americas urged governments in the region to pause before embarking on major arms purchases. Between April 1997 and March 1998, 28 current and 14 former heads of government signed a pledge to accept a moratorium of two years on purchasing sophisticated weapons. Among the signatories were Guatemala President Alavaro Enrique Arzu Irigoyen and former President Vinicio Cerezo. 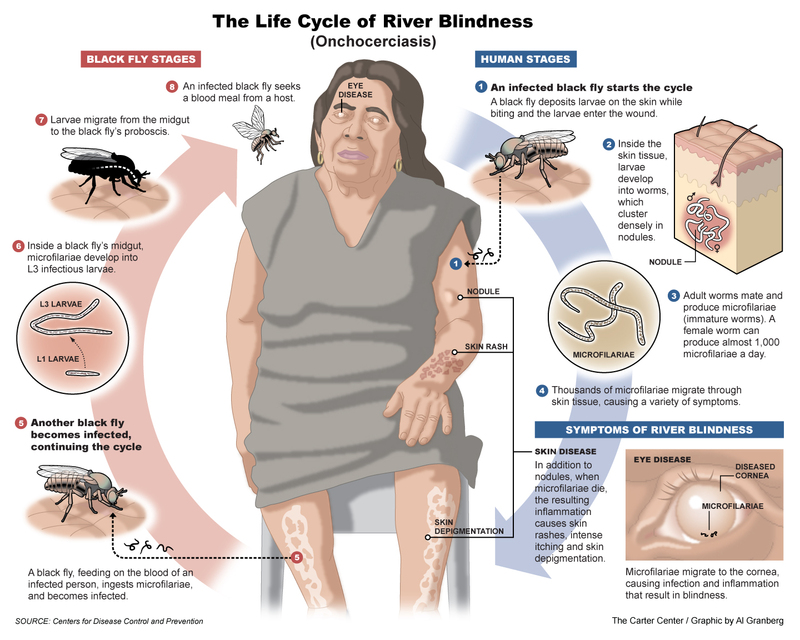 Latin America has made great strides to control river blindness, so that now, provided treatment and health education initiatives continue, permanent blindness from the disease no longer is a threat. Yet, until two decades ago, those who suffered from this painful and devastating disease had no hope for treatment. Guatemala's hot and humid coastal plains were once among the areas most severely affected by onchocerciasis (also known as river blindness). At particular risk were coffee-producing areas of the country, where fast-flowing streams providing irrigation to nearby coffee farms can be breeding grounds for the black flies that spread the disease. In 1915, Dr. Rodolfo Robles Valverde, a renowned Guatemalan scientist, discovered in the Americas the correlation between the parasite and ocular disease in the little town of Patulul. Onchocerciasis is still known as Robles' disease in Guatemala and in the Americas region. The Guatemalan Ministry of Health formally began its national River Blindness Program in 1935 with a widespread campaign to control onchocerciasis in the four endemic focus areas for treatment: Central, Escuinta-Guatemala, Huehuetenango, and Santa Rosa. At the time, the program's main control strategy was removing onchocercomas (nodules) n these endemic areas. Studies with drugs (the microfilarial diethylcarbamazine in the 1950s, and the macrofilarial suramin in the 1970s) were conducted parallel to nodule removal, but the drugs had serious side effects and were not adopted as national program strategy. In 1987, Merck pledged to make Mectizan, a modern microfilarial drug, available to "all who need it, for as long as needed." In 1988, Mectizan® was made available in the Guatemalan field. In 1990, philanthropist John Moores created the River Blindness Foundation to distribute Mectizan to as many communities as possible. The next year, the Multinational Strategic Plan of Action for Onchocerciasis Elimination was submitted to all regional ministers of health at the XXXI directing council of PAHO meeting in Washington, D.C., and the ministers passed a resolution to "eliminate onchocerciasis as a public health problem in the Americas" by the year 2007. When pilot studies with Mectizan were successfully completed in Guatemala in 1991, the drug became the primary elimination strategy for the program. The national program's efforts were interrupted for two years after the decentralization of Guatemala's public health services in 1994. In 1996, The Carter Center absorbed the River Blindness Foundation and began support of the national programs of all six endemic countries in the Americas, and Guatemala's Ministry of Health resumed treatment activities. At that time, Guatemala was the most endemic nation in the Americas, accounting for over 40 percent of people at risk for onchocerciasis in the region. The disease threatened more than 500 of Guatemala's poorest communities. Guatemala first achieved the goal of treating 85 percent of the target population in all four focus areas (nearly 160,000 people combined) in 2002. It continued to reach this threshold each year. In 2006, studies concluded that onchocerciasis no longer existed in the Santa Rosa focus. The next year, the Ministry of Health decided to halt Mectizan treatments in Santa Rosa and maintain a post-treatment surveillance (PTS), a three-year monitoring period during which black flies and blood samples from the formerly endemic area are tested for evidence of onchocerciasis. Santa Rosa was the first of the 13 onchocerciasis foci in the Americas to make this decision, paving the way for others to prepare for similar treatment withdrawal. The Escuintla-Guatemala and Huehuetenango foci followed in 2008 and 2009, respectively. PTS entomological assessments in these three foci showed that transmission of the disease remained interrupted. Surveillance activities were halted in Escuintla-Guatemala and Santa Rosa in 2010, and in Huehuetenango in 2011. The largest and final Guatemalan focus, Central, stopped mass treatment activities and entered PTS in 2012. Surveillance activities were completed in 2014. One hundred years after Dr. Robles first discovered the disease, Guatemala submitted a request to the World Health Organization (WHO) for verification of elimination. A WHO International Verification Team visited the formerly endemic areas of Guatemala from May 30-June 10, 2016. The team’s report confirmed that the transmission of the onchocerciasis parasite had been successfully wiped out from all for focus areas in Guatemala, and WHO Director General Margaret Chan sent an official letter of verification to the Guatemalan government. Guatemala’s minister of health, Dr. Lucrecia Hernandez Mack, made the country’s official announcement on Sept. 29, 2016 at the Pan American Health Organization’s 55th Directing Council Meeting in Washington, D.C. Today, as a result of national leadership and strong partnerships, approximately 230,000 people in Guatemala’s four formerly endemic areas are no longer at risk of contracting river blindness.